Teena was in New Brunswick last week and brought me back a couple of bottles of Soeur Catherine from Petit-Sault Brewers, who brew out an old police station in Edmundston, New Brunswick. 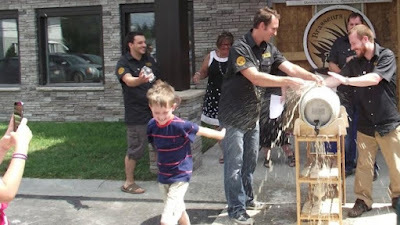 The brewery officially opened its doors on July 27, 2014 by tapping its inaugural keg outside the doors of the brewery. Although it is André Léger, Mychèle Poitras and André Morneault who run the brewery, they do have the support of 80 local investors. Now that's community spirit! Petit-Sault Brewers wanted to do more than just brew beer. They also wanted to tell local stories. For instance, Soeur Catherine is named after a real teacher from the area, Sister Catherine. According to a September 13, 2015, article from The Guardian, "People that had her as a teacher remember her as a very bitter person," said Leger. "Having an IPA named after her was very natural." And how is the IPA? First off, I like the stubby bottle and the label. They're both fun. When I snapped the cap off outside, I found the aroma leaped out into my nose. It was quite citrusy. The beer poured amber in colour with a white head. Lots of lacings line the inside of the glass as I slowly make the beer disappear. This IPA has a very nice bitterness. Although it was bitter citrus that greeted my nose, the hop bite in this is quite piney ... and extremely enjoyable! It starts with a hop bite that increases in intensity right into the very long finish. This is an extremely well-done ale that I am quite enjoying. I'm glad Teena brought me back two. Going to have the second while I BBQ.